Elizabeth Garcia Hall joined Food Fight in 2008 as the Co-General Manager of the Riverview Terrace Café (a seasonal restaurant in within the Frank Lloyd Wright Visitor Center in Spring Green, Wisconsin) and moved into her position as Director of Hospitality in early 2014. During her time with Food Fight, she has seen the organization "celebrate its successes, recognize its disappointments, and develop a new generation of leaders. Food Fight cultivates the strengths of its employees and the most notable changes have resulted from that growth from within." Elizabeth attended the University of Minnesota and the University of Wisconsin. After earning degrees in Spanish and Women's Studies, she worked as a legal assistant and as a translator and interpreter for private clients/companies as well as schools and organizations. 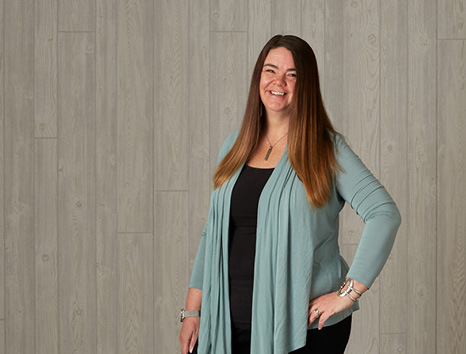 While she did not necessarily have an eventual vision of managing the hospitality efforts of a restaurant group, Elizabeth's passion lies in "taking care of people and making them happy," and her current position affords her the ability to do that every day. "I love having the daily opportunity to bring joy to our employees and our customers. I love taking 'meh' and making it 'magnificent.'" When asked what she loves about working for Food Fight, Elizabeth's answer is thoughtful, even philosophical (and contains a possible company name change): "It's the family we have become and the community we serve. I wonder if we should call it 'Food Family,' because we don't really fight much."